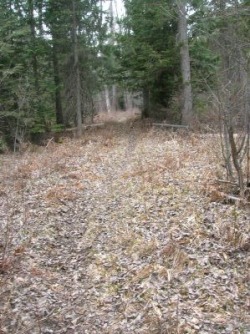 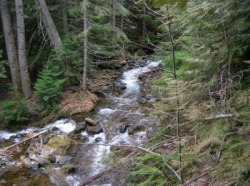 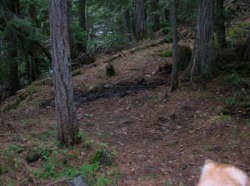 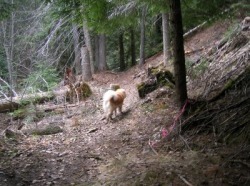 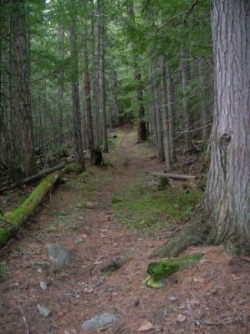 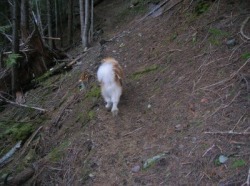 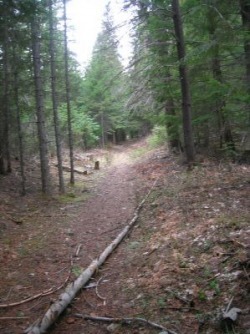 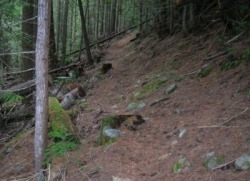 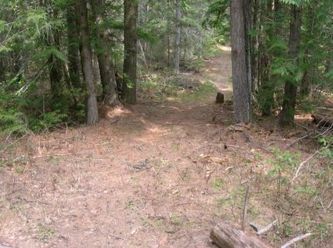 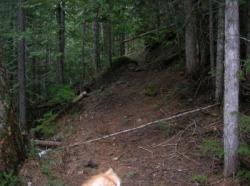 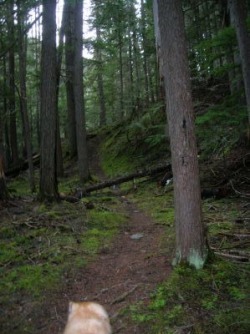 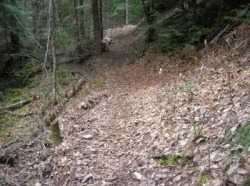 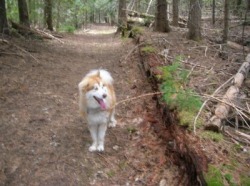 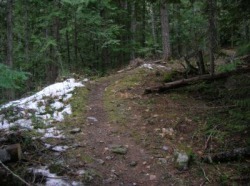 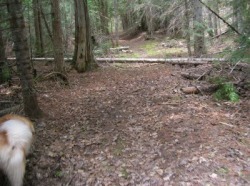 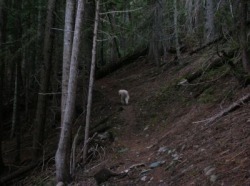 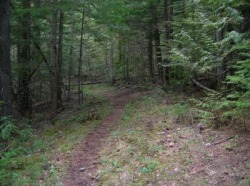 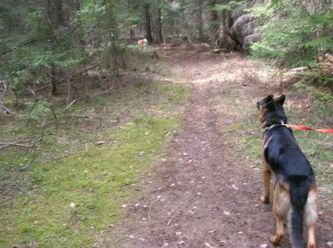 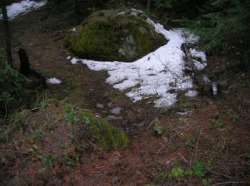 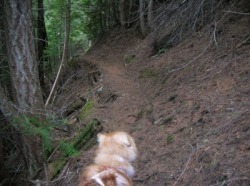 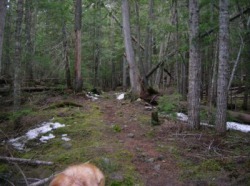 This is the our regular hiking and mushing path, Parmenter Creek Trail #140. 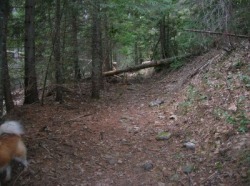 Parmenter creek to the left and the trail to the right. 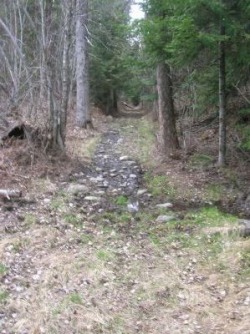 A little water in the path. 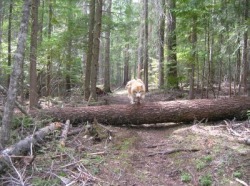 There is always a log or 2 across the path, those two in the back I had to cut, to get my sled through. 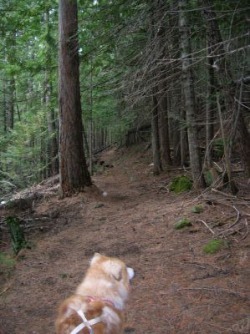 If only it was always this easy!! 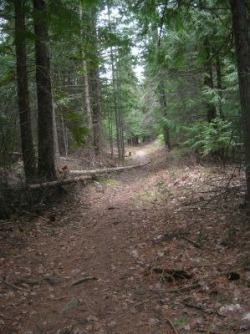 The trees cover the trail in a straight stretch for over 1/4 mile. 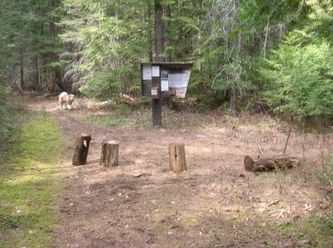 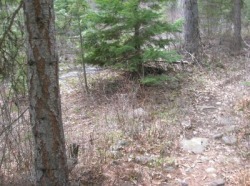 An area where the black bears hang out. 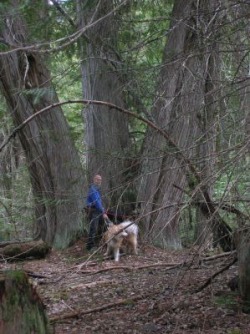 Randy, Gus and Chantry next to a large western red cedar. 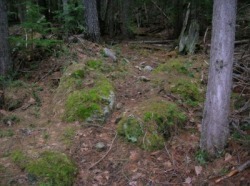 Chantry next to an old rotten log. 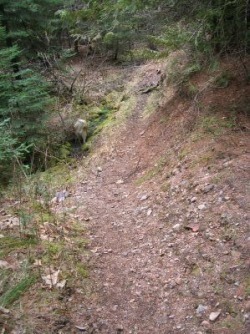 This is steeper than it looks and it runs for a couple hundred yards like this, up and down. 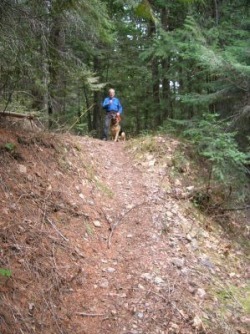 Randy and Gus at the top of the hill. 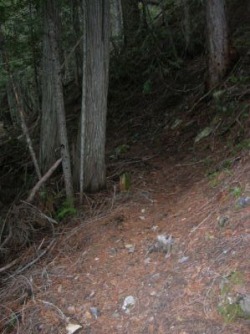 A narrow spot in the trail. 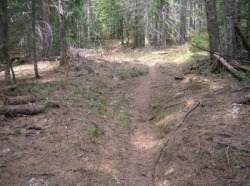 An easy spot in the trail. 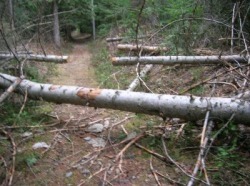 How many logs are there ? 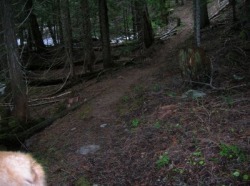 Decisions which way to go. 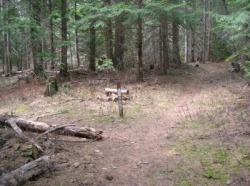 No bicycles beyond this point. 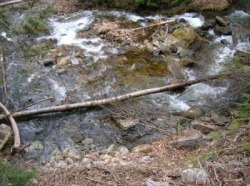 During snow-melt this runs with water. 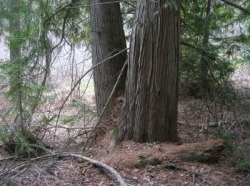 A western red cedar next to the trail. 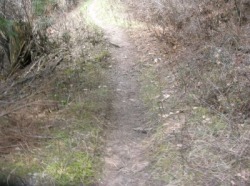 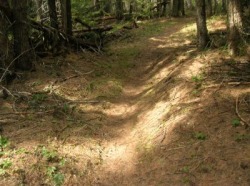 A wide spot in the trail. 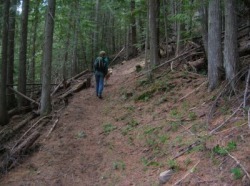 "A good stretch of the legs"
The malatractor pulling Chris up the trail. 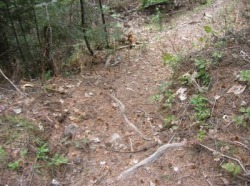 Don't slide of the trail!! 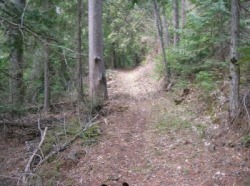 How narrow can it get ? 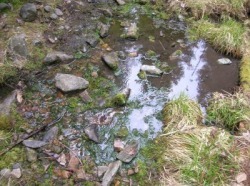 A drop off to the Creek. 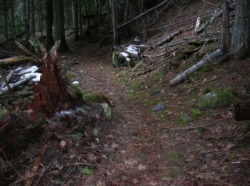 An old broken off stump. 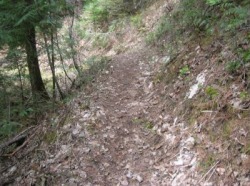 "Can you still keep going on?"